38% of site visitors will leave a website if they find it unattractive. 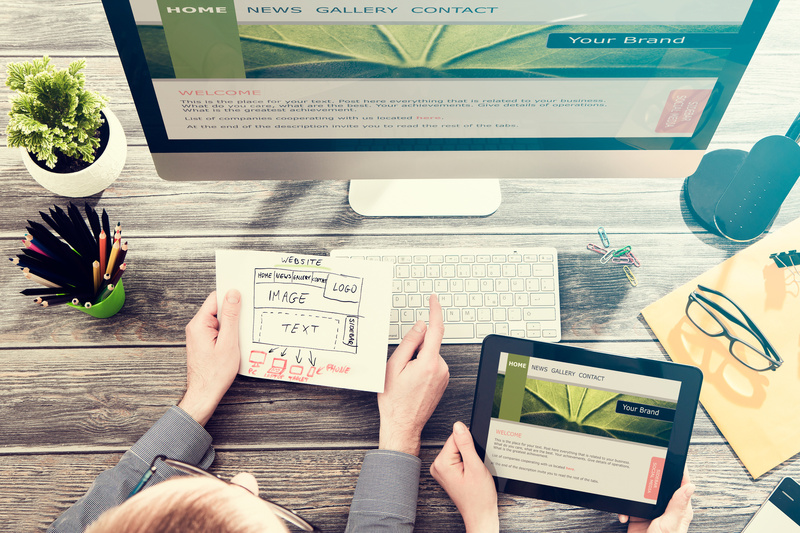 With websites being the first impressions for most businesses, it’s easy to see why it’s so important to perfect your small business website design. When building a website, there’s nothing more eye-catching than a clean and welcoming header image right on the home page with a strong call to action. However, this isn’t always executed the way it should be. First, if you’re counting on that header image to make a first impression, make sure it’s quality. That means only using high-resolution photos, that are the right size, that may have to be purchased. Also, it’s incredibly important to keep your photo relevant! So while, yes, that photo of the little girl holding multiple red balloons is adorable, if you can’t find a way to relate it to your business or what you do, ditch it. Yes, creating fresh copy for your website can feel like a daunting task. However, this is the face of your business, and no one can give a voice to your business better than you can. On the slight, (yet possible) chance that you are incredibly bad at writing, take the best crack it that you can and then hand it over to a professional copywriter that can “polish” it for you. Your website is a great place to familiarize your audience with your brand, tell a story, provide powerful content and more. Which can make it easy to veer off from the original goal of your site. To avoid this, know the original goal of the site. Do you want to be informative enough to attract potential investors? Are you looking to rebrand your business and shed an old image? Maybe you just want to focus on selling products. Be sure that your goal is the central focus of your site, and make the rest added value. If someone chooses to visit your site, chances are they are interested in what you have to offer. However, if they are like the rest of us, they also have an attention span of roughly 8 seconds. Don’t let them leave without a way of staying in contact! By using the right tools and methods for your opt-in form you can build your list in no time. Customer service plays a huge factor in audience approval and return rates, so why not take advantage of this on your website? Installing chat features on your website gives the visitor direct access to you and your team and turns a one-way visit into a two-way conversation. The great news is, you don’t have to be available 24/7 to do this either. Many of the chat programs offer a “message option” so you can receive an email when you’re out of reach. Your site visitors want to know what your business is about, but they also want a sense of who you are and what you represent. This is where social media plays a powerful role in your small business website design. Through your site, you can make it easy for visitors to follow your various social media platforms and even import your Twitter, Instagram and Facebook posts to be visible directly from your site. While you want to use your site as a point of exposure for your social media platforms and channels, you don’t want your visitor to actually leave your site to visit these pages. Often, business owners will invest their time on social media pointing their audience to their website. Then once a visitor finally bites and visits the site, they are presented with countless options to leave the site again. Limit exit points and focus on retaining your visitor’s attention. Is there anything more frustrating than slowly loading websites? In fact, how often have you just exited out of a site that takes to long to load? You want to avoid this happening on your own page. This might mean removing some of those heavy video files or limiting the number of pages on your site. Not only will a slow site make visitors want to leave but it can actually hurt your search engine ranking. We recommend using a tool to determine the speed of your site and if there’s room for improvement. Today, a vast majority of our online experience happens to our smartphone. Which can be a problem if your beautiful web page doesn’t translate well to a mobile site. The good news is, there are ways around this. Many site builders offer a mobile view of your page so you can see how it will look on a mobile device before publishing it. You can also choose to host a completely different website that phone will automatically be relocated to for a more user-friendly experience. A beautiful website is important, however, a beautiful website people can actually find is even more important. This means using some handy SEO techniques throughout the development of your site, such as correctly implementing keywords when needed. Give your visitors a reason to come back often by providing valuable content. This can be done in the form of a content grab (a free download to entice visitors) or a blog. Whatever method you choose, make sure your content is relevant to your audience and your brand. If your goal is to push the sales of products, do so, but try not to be too pushy. This means rather than bombarding your audience with sales information as soon as they enter your site, drop breadcrumbs as to why your product is worth buying. This doesn’t mean there isn’t a time and place to put your sales cap on. Most businesses save their sales heavy content for a specific page like a “how it works” or “about our services” page. This creates the feeling that you’re informing the visitor, not reaching for their wallet, and that will help you build the foundation for a long-lasting B2C relationship. When it comes to the perfect small business website design, sometimes it’s best to enlist the help of professionals. We invite you to contact us today so we can assist you with your web design needs, increase traffic, and help you market your brand to the right audience.